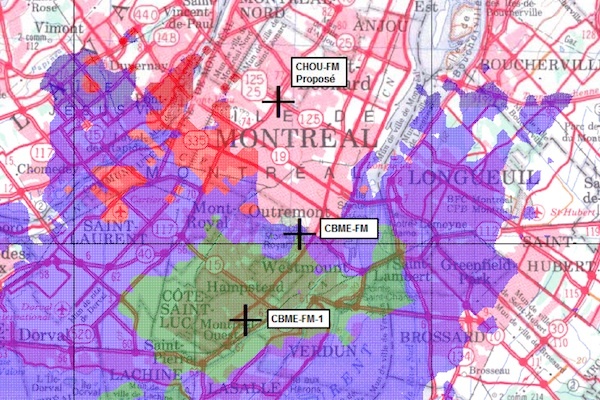 A year and a half after rejecting a technically identical proposal, the CRTC has approved an FM retransmitter for Radio Moyen Orient (CHOU 1450 AM) in Saint-Michel. The new transmitter will operate at 104.5 FM with a power of 50 watts, from an antenna on top of the Sami Fruits building on 19e Ave., near Pie-IX and Jarry. 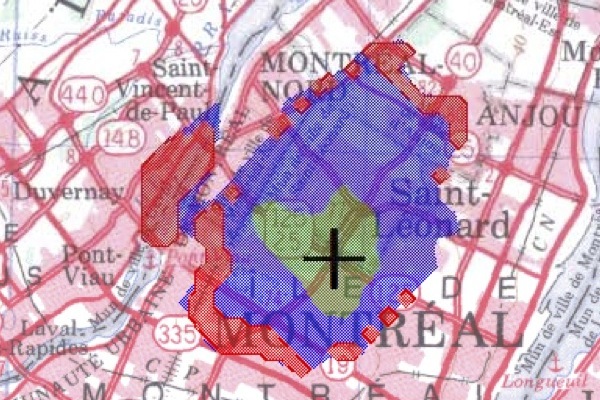 The map above shows its limited coverage area, and the red parts show where it can expect interference from other stations. The biggest source of mutual interference will be CBC Radio One’s transmitter at 104.7 in N.D.G., which will be harder to hear in areas of Ahuntsic and Villeray. But people in those areas will be listening to CBC on 88.5 anyway. So what changed at the CRTC to change their minds? That’s a good question, because I can’t really find any differences in the applications. It uses the same technical parameters, the same arguments, the same listener complaint letters and the same field measurements. But for some reason, the commission now believes the station has demonstrated a technical need for the retransmitter, which is at the edge of CHOU AM’s service area. In the Commission’s view, the new transmitter would allow approximately 14,000 Arabic speakers to receive CHOU’s ethnic programming, mainly in Saint-Léonard. However, coverage may not be adequate in all of the targeted neighbourhoods because the proposed low-power transmitter would experience interference in most of its secondary service area. So maybe the commissioners just changed their minds on the subject. The decision means speakers of Arabic and other Middle-Eastern languages will be well represented on the FM band in Montreal. CKIN-FM 106.3, which was purchased by Neeti P. Ray last summer, has changed its schedule to be mostly Arabic. CHOU has two years to implement the new transmitter, unless it requests an extension. Other FM frequencies can still be used for medium and low-power transmitters. An application is pending for 90.7, and the CRTC has determined that 107.9 isn’t protected. Amazing how qualified engineers are able to come up with available spots on the FM band in Montreal to accommodate applications such as this. Too bad the technical wizard behind the rejected low-powered relay of CJLO AM 1690 couldn’t figure out how to find an appropriate place for them to be able to cover the downtown Concordia campus. He insisted that 107.9 was the only possible available frequency! Too bad the technical wizard behind the rejected low-powered relay of CJLO AM 1690 couldn’t figure out how to find an appropriate place for them to be able to cover the downtown Concordia campus. The application for 107.9 was technically sound. The CRTC just didn’t think it was an appropriate solution. And it’s not clear that 104.5 would have worked downtown, since it’s closer to the N.D.G. transmitter. Sorry for not putting my name on the first comment; merely an oversight on my part. I’m not implying that 104.5 would have been a solution for CJLO. What I’m saying is that, with proper engineering studies, one of several other frequencies could have been proposed for a low powered relay of CJLO. Given the very small footprint that CJLO wants to serve with an FM relay, at a very low power, any one of a number of possible frequencies would have been a better choice than a frequency that has a 40 kw signal pounding into Concordia’s Hall building on cheap radios, even with telescopic whips fully collapsed! i am cjlo s broadcast consultant NO other fm frequency could provide the service that cjlo needs downtown 104.5 being second adjacent to the cbc repeater located in ndg 104,5 connot be located downton it would interfere with the cbc repeater. 104.5 cold only be located in the area that it just being licenced the same for 90.7 would only work in st laurent and had to obtain a waiver from 90.3 ckut. broadcast consultant for many stations including cjlo. You have to think that someone could come up with a solution for CBME that doesn’t require the extra transmitter on a different frequency. It seems like an incredible waste of resources. The solution would be to give a little better radio to the 10 or 12 people in the West End who can’t hear 88.5 because they have crappy radios! I’d love to know exactly how many people reported that they couldn’t get a clear signal off of 88.5. I would guess that someone from the CBC itself lives there… and they complained. Maybe to move the relay to the frequency 0.2 kHz from the main station? This solution works in countries such as France, Netherlands etc., even for public broadcasters. Oops, I meant 0.2 MHz. Third adjacent channel interference protections require LPFM stations to be separated by at least 0.6 MHz from all other stations with the intent of preventing signal interference.